1946, Marseille – one of the most notorious cities in the world. The war still casts its heavy shadow. There are accounts to settle, wounds to heal – and lives blighted by great loves cut short. But life goes on, with a renewed hunger for fun and pleasure. Welcome to the fleshpots of Marseille's fabled Red Light District! Welcome to L'Orchidée – Marseille’s premier house of vaudeville and burlesque, whose dancing girls are renowned for the extras they bestow. Everybody's welcome – especially an American drifter with a hole in his heart and guilt rattling around in his head. 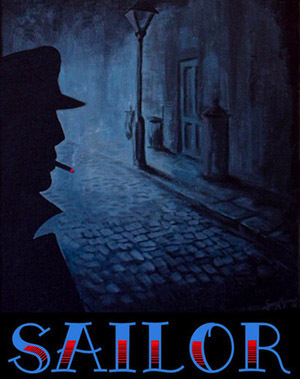 Sullen, silent, mysterious, he is simply known by his nom de guerre, “Sailor” – a disgraced wartime hero unable to shake off the obsession for the woman he loved and lost. And then her younger sister shows up at L'Orchidée – looking for work. Sailor is a tale of wartime loss and adventure, but also of redemption and love resurgent. Over thirty years ago, Sailor began as a romantic drama in the mind of composer and writer Georg Kajanus. His passion for the romance of the sea and the seedy Red Light Districts of Europe had culminated in a bittersweet musical about two people searching for love in the ruins of post-War Marseille. Although Kajanus had written the music, lyrics and book for the musical – then titled The Red Light Review – in the end, it never saw the light of day at that time. Instead, Kajanus chose to form a uniquely theatrical pop music group with Phil Pickett, Henry Marsh and Grant Serpell, which he called Sailor. Sailor subsequently released five albums in the 1970s and two in the early 1990s, many of which contained songs from his musical. In 1976, A Glass Of Champagne rose to the top of the pop charts in England and throughout Europe, and still has a presence today on radio and in films, TV commercials and covers. Girls Girls Girls also achieved Top Ten status in the UK and across Europe, and has remained a radio and nightclub standard ever since. In total, Kajanus’ compositions for Sailor have gone to the top of the European charts 28 times in the 1970s and the 1990s, as well as in 2008. In 2008, Kajanus began to work with playwright-screenwriter Roberto Trippini and actress-writer Barbie Wilde on a new version of his musical Sailor that contains a unique perspective on life, violence and love. Sailor is not only a romantic voyage – it also depicts the brutality of war and life on the fringes of society. 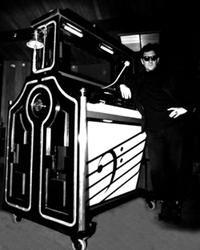 The Nickelodeon, whose inventive mechanics produced the trademark sound for Sailor the group and Sailor the musical, was designed and built by Kajanus initially out of necessity: to enable two of the four Sailor musicians to simultaneously play the equivalent of six instruments between them to recreate the sound of Kajanus’ original demos for The Red Light Review.